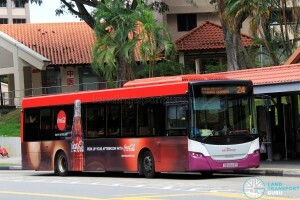 SBS Transit Bus Service 24 is a trunk route operating between Ang Mo Kio and Changi Airport, via Paya Lebar, Bedok and Upper Changi. Alight at Changi Airport Terminal 1 for direct access to Jewel Changi Airport through the arrival hall. 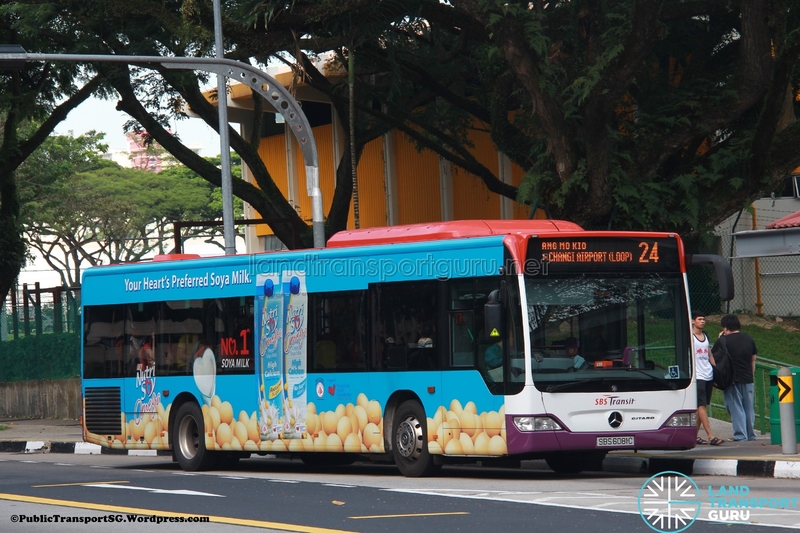 Service 24 is a loop trunk route between Ang Mo Kio and Changi Airport, serving Serangoon, Upper Paya Lebar, Paya Lebar, Eunos, Bedok and Upper Changi. Introduced as part of the 1983 Changi Airport Bus Plan, it replaces previously existing bus routes and remains today as a unique connection along much of its route. This service duplicates the East-West Line between Paya Lebar and Tanah Merah, and closely follows Service 22 between Ang Mo Kio and MacPherson. Due to the loop-route nature of Service 24, as well as irregular demand across the day, this route is very prone to bunching-up. Frequencies during peak hour can exceed 20 mins. Sectors of high demand are between Bedok and Upper Changi where the route connects to private housing and new developments along Upper Changi Road East. 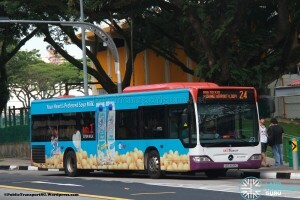 Former Short Working Trip 24A operated daily from Ang Mo Kio Int to Tanah Merah MRT Station, where the bus would do a u-turn and operate as Service 24 back to Ang Mo Kio Int. Departures from Ang Mo Kio Int alternated between the main Services 24 and 24A then. Service 24 serves Changi Airport Terminals 3, 1, 2 & 4 in order. Changi Airport Passenger Terminal Buildings (PTBs) 1, 2 and 3 have their bus stops integrated into their basement levels, which also serves as a cargo loading and unloading bay. Security checks for any unattended or suspicious articles are carried out before a bus enters Terminals 1, 2 and 3. Bus Captains may take a short toilet break at Terminal 2. Because of height restrictions, double-decker buses are unable to enter Changi Airport basement. Occasionally when Changi Airport basement is closed, buses will be diverted to to T1/T2/T3 Departure Drive where a temporary bus stop will be set up. 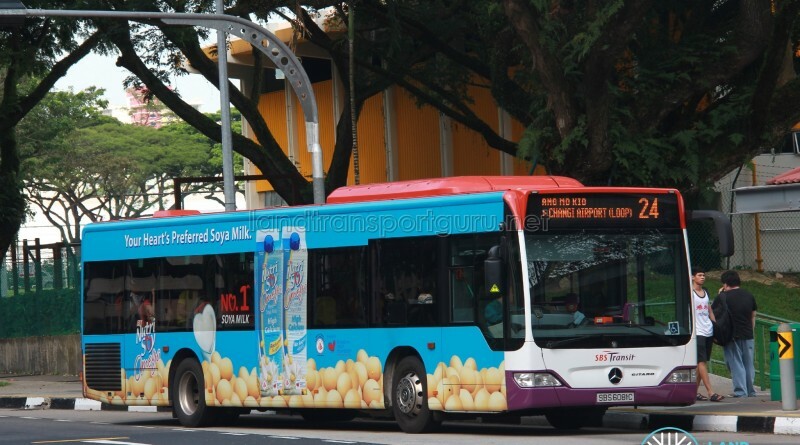 A fleet restriction for Changi Airport appears to be in place, with only Mercedes-Benz O530 Citaro buses deployed on airport-plying bus services. Announcements for passengers to inform the Bus Captain if they see any suspicious person or article are played on board public buses at Changi Airport as well. Fare: Charges basic distance-based fares. See Bus Fares. 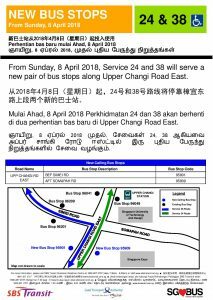 1983 (25 Jun): Introduced as Service 24 to replace Services 392 (Bedok Int – Changi Airport), 394 (Somapah Int – Changi Airport) and 727 (Ang Mo Kio – Changi Airport), all withdrawn due to low demand and overlapping routes. 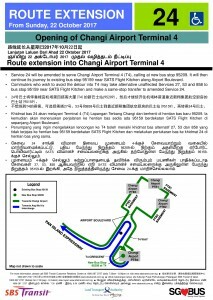 Route plying Ang Mo Kio Int – Changi Airport PTB1. 1983: No significant route changes since 1983.